By Chris Seekings - 21 August 2018. 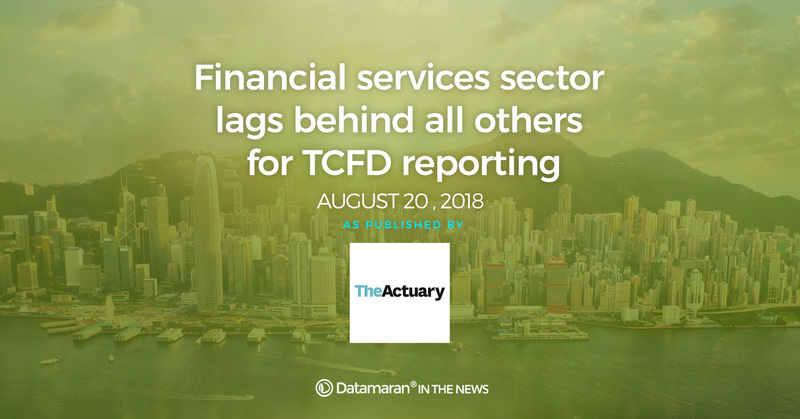 Companies in the financial services sector are the least committed signatories to the Task Force on Climate-related Disclosures (TCFD), new research has found. Analysis of their annual reports shows that the percentage of non-financial TCFD signatories placing a high emphasis on climate change risks is double that of financial ones. This is despite the financial services sector representing around half of the more than 300 firms signed up to the TCFD, and approximately $17trn (£13.2trn) in market capitalisation. Donato Calace, director of innovation at software firm Datamaran, which carried out the research, said the results were “not surprising” and that financial services must step up. “They have the power to influence the market through impact investments, green bonds, and loans,” he continued. The TCFD recommendations were published last year to help businesses report consistent, comparable, and reliable climate-related information to investors and lenders. Some of the world’s largest pension funds, banks, insurers and asset managers have given their support to the initiative, as well as corporate giants like PepsiCo and Unilever. The latest research shows that 35% of non-financial signatories place a high emphasis on climate change and air quality in their annual reports, compared with 17% of financial firms. It was also found that financial companies only started to put more emphasis on climate change after the TCFD recommendations, but that non-financial firms had done so a year before.